← President Obama’s coming to Elkhart. Again. He’ll be talking about the economic recovery. President Obama is long gone. His visit here is not forgotten, though. It offered me a unique opportunity — traveling in the motorcade with the press and seeing all the machinations that go into a presidential visit. Plus, I saw Obama for the first time, heard him speak. I embedded as a local pool reporter when he came on June 1, writing up brief accounts via my iPhone for media consumption of the president’s movements as the trip progressed. I saw him arrive and leave on Air Force One. I watched his speech at Concord High School, getting a glimpse of The Beast, the limo that hauls him, and got access to The Lerner Theatre, where he taped an hour-long PBS town hall meeting. 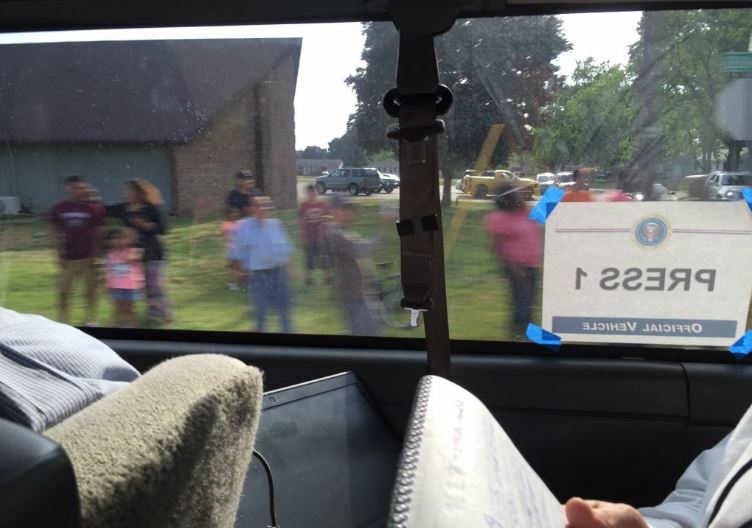 Amazing seeing the people lining the road to get a glimpse of the motorcade. Incredible the security. Incredible how well-oiled a machine the motorcade is. Of course I tweeted, posted on Facebook and posted Instagram pics all along.